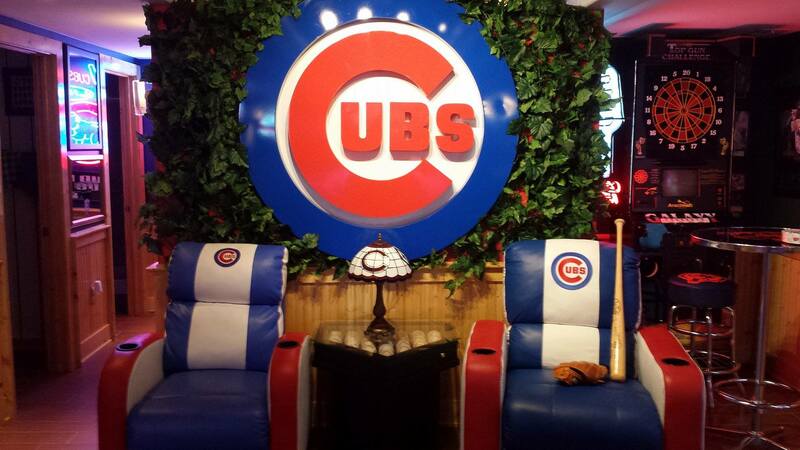 Ever since he was a child, the Stewart McVicar had a vision in his head of a Cubs man cave when he owned a home. He and his wife, Lisa, were looking for houses years back and while Lisa was upstairs checking out the rest of the house, Stewart would be in the unfinished basement, wondering if it could house the den idea he held in his mind. “From day one when we moved into this place, I was thinking about the man cave,” McVicar said. 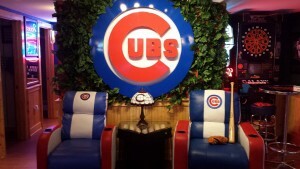 Before it was even finished, MLB Fan Cave web site chose McVicar’s place in his northwest suburban home to be its ultimate man cave. By August 2013, Club 400, as it’s dubbed, became a reality. Equipped with a full bar (shaped in a Cubs’ C of course), TVs everywhere you could imagine (even in the bathrooms), a commercial-quality lighting and sound system, bricks from the same lot the Cubs used during their renovation, an arcade and enough Cubs heirlooms to furnish a museum, Club 400 has become ubiquitous as the Cubs advanced to the National League Championship Series against the Mets. McVicar hosted a party for the Cubs’ 4-0 win over the Pirates in the Wild Card game, and CBS 2 had a camera crew stationed at his house for nine hours to document the action. At Wrigley Field, other fans now recognize McVicar. Behind all of the technology and notoriety, however, is the actual treasure trove of memorabilia that McVicar has amassed. McVicar started collecting Cubs memorabilia when he was 8 years old — and he’s still collecting. Since that Wild Card party, McVicar acquired autographed bats used in games by Cubs rookies Kris Bryant and Kyle Schwarber. “I figure, they’re only going to be rookies once,” he said. McVicar has hundreds of autographed baseballs, displayed in several unique cases throughout Club 400. He has so many autographed baseballs that he has boxes of them still in storage, though he is hatching a plan to display them. He has some artifacts that people just can’t get their hands on. 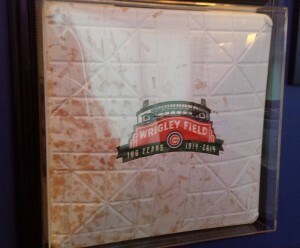 The centerpiece is a giant Cubs logo that used to hang outside of Wrigley Field next to the administration offices behind the Ernie Banks statue. It gets replaced on occasion. Of course, McVicar has one, the first thing that pops out when you enter Club 400. 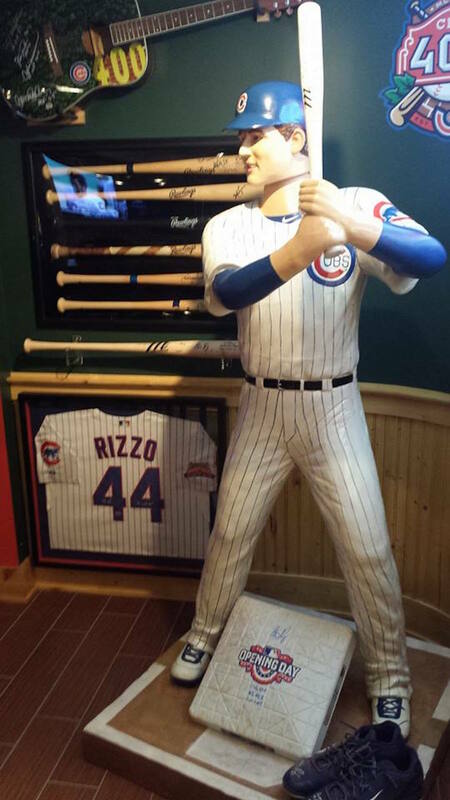 After attending a party at Club 400, Cubs owner Tom Ricketts had a 6-foot tall bobblehead of Anthony Rizzo made and sent to his house, the only one of its kind. It is accented by an autographed base, cleats and jersey from Rizzo. 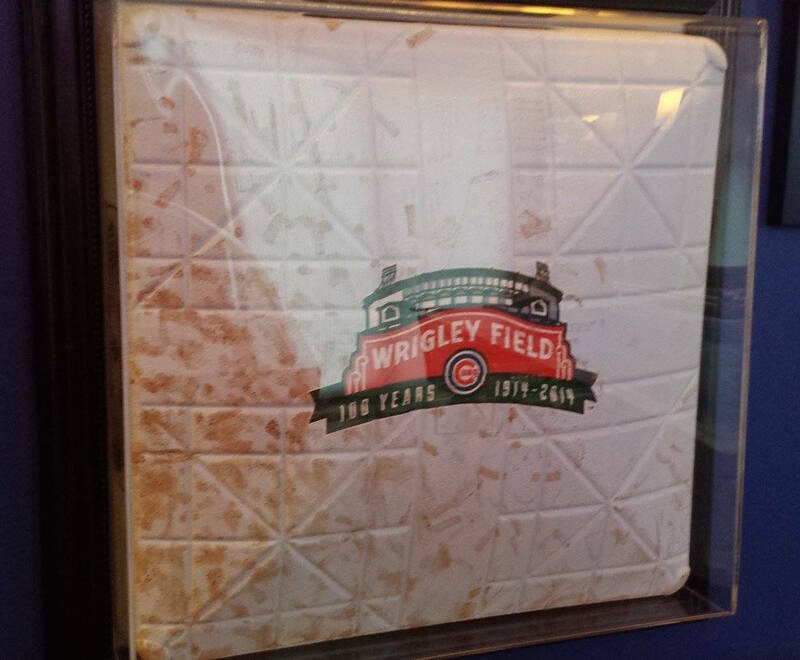 McVicar has a game-used base from the Cubs’ 100th anniversary game in 2014. “It wasn’t sold to the public,” McVicar notes. McVicar has several favorite pieces, among them a ball from a 1918 game between the Cubs and Giants, a bat from former second baseman Glenn Beckert that is repaired with small nails, as was customary in those days, and a scorecard from the day he was born. He also has in his possession the Cubs’ lineup card that hung in the dugout on the day he and Lisa were married, the ticket stub from his first-ever Cubs game, and an actual locker from the Wrigley Field clubhouse.